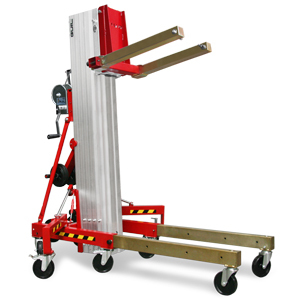 Material lifter manufactured in aluminium and steel, designed to lift loads of up to 400 kg up to a maximum height of 5 metres. Its compact design, with a stowed height of just 1.61 m allows it to be transported in small vehicles. 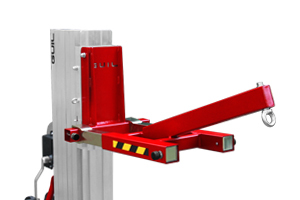 Its wide variety of applications and its easy handling, make the TORO D-403/C Lifter the perfect complement for any type of job. 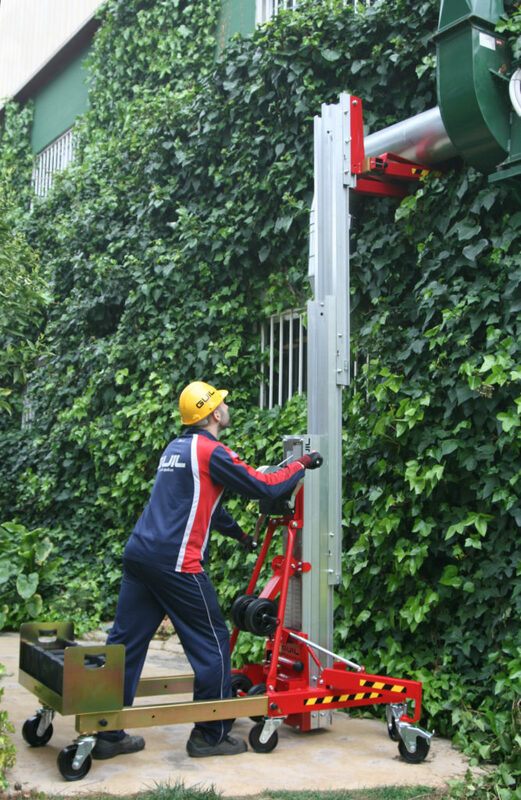 The TORO D-403/C lifter that thanks to its components has a sturdy but light design, is certified to lift loads of up to 400 kg to a maximum height of 5 metres. 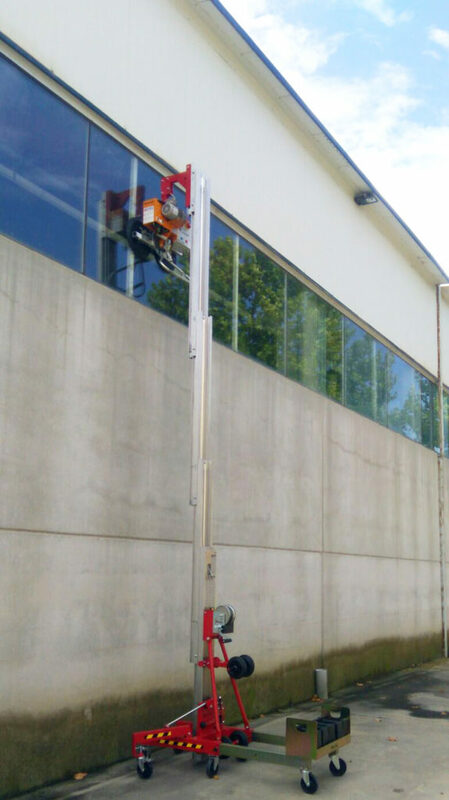 This Material Lifter, with 4 aluminium mast profiles that are raised with a pulley system, is supplied with all the necessary components and accessories for its use: side stabiliser legs with levellers, forks, double-handled winch, wheels for vertical and horizontal manoeuvring, etc. 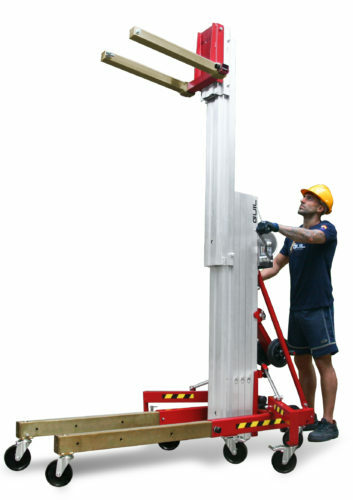 The lifter is equipped with an automatic brake winch (ref. : BULL500/2) which stops and holds the load at the desired height; when the handles are released the automatic brake holds the load in place. 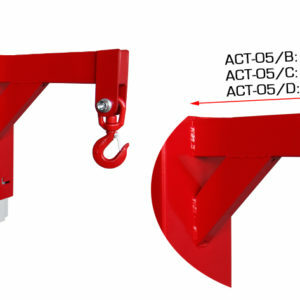 The winch has two removable crank handles so that the tower can’t be used by unauthorised personnel, and also saves on space for the transporting and storage of the lift. 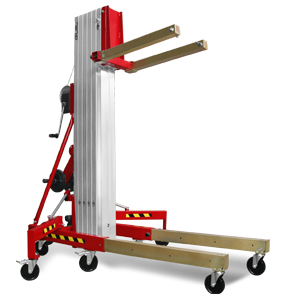 Thanks to its special design to easily load it into vehicles, the simple positioning of the load to be lifted and its quick and easy set-up this lifter is considered one of the most functional towers on the market. 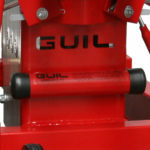 Note: GUIL has designed a practical and safe way to raise the TORO D-403/C with an electric system (ref. ELECTRIC-D). 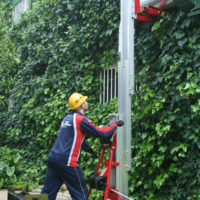 This electric system (sold separately) converts the lifter into an electric tower. 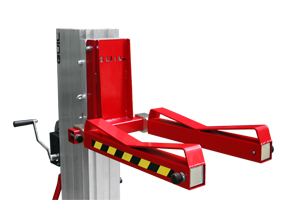 – Robust yet lightweight and compact lifters, designed for jobs that require a high load capacity. 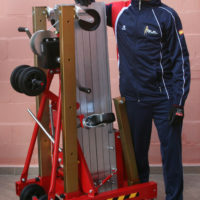 – Maximum stability, Safety and Strength. 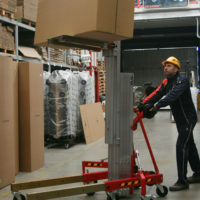 – TORO towers can be operated by one person. Timesaving > Increase in productivity. – Compact and lightweight designs for easy handling. Corridor and single-door accessible. 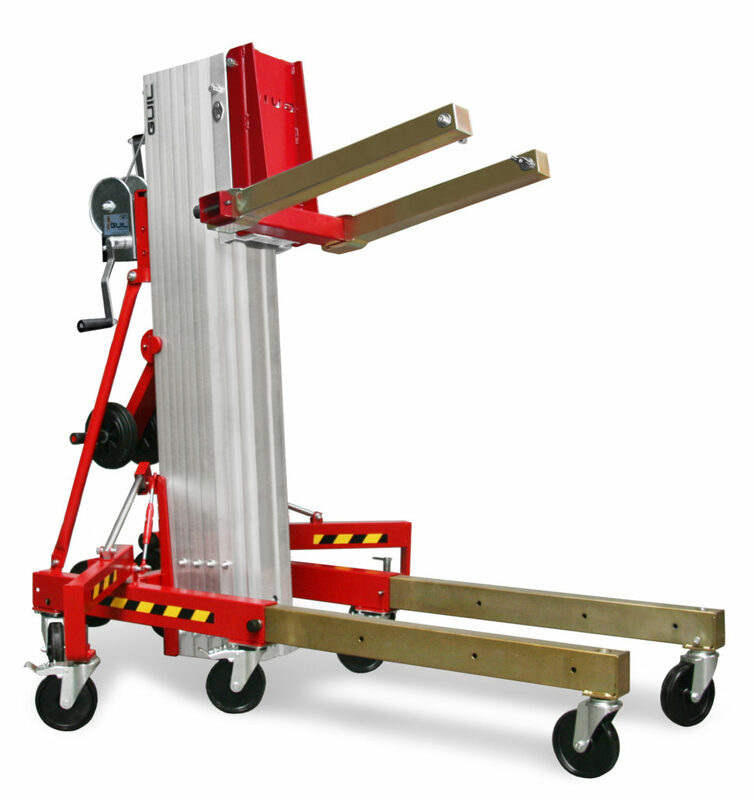 – TORO lifters can be manual or electric, purchasing the “ELECTRIC” system (sold separately). 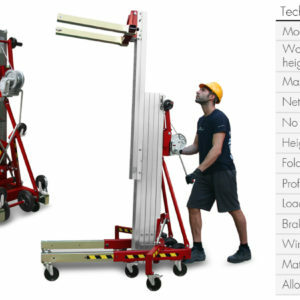 – Fast and easy set-up with no tools required. There are no loose parts. 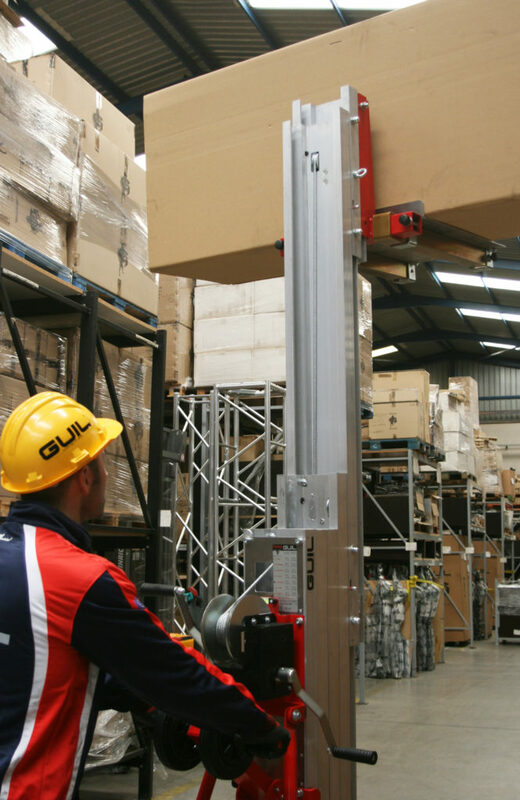 – FULLY EQUIPPED towers: they are supplied with all the components and accessories necessary for their immediate use (Note: ACT adaptors aren’t included). 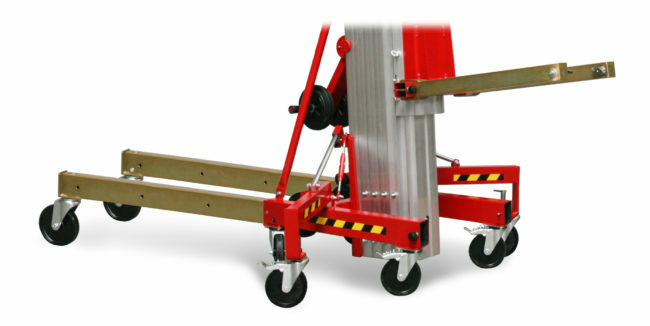 > Folding stabiliser legs, provided with adjustable wheels for levelling. 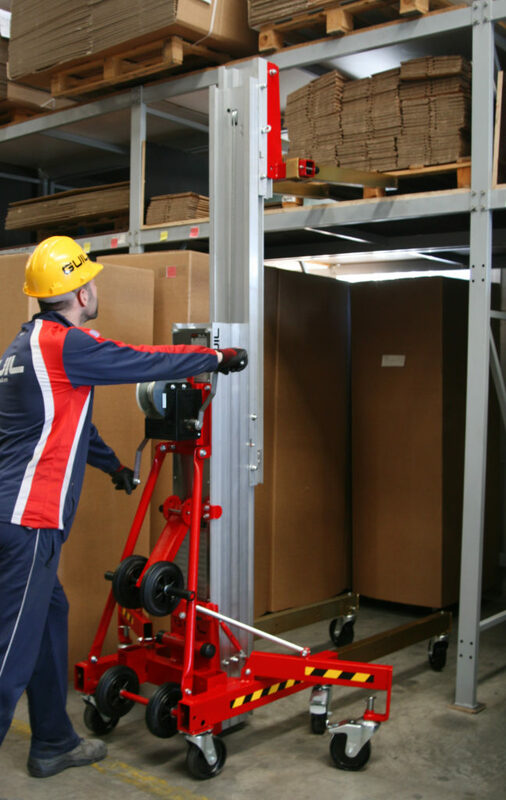 > Removable, adjustable and reversible load forks. 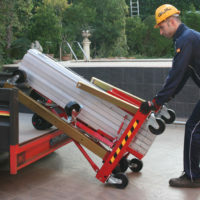 > Removable legs with telescopic design, provided with adjustable wheels for levelling. 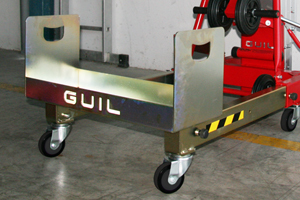 > 8 Heavy duty wheels for vertical and horizontal manoeuvring and its loading onto vehicles. 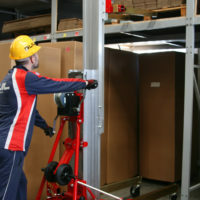 – Telescopic removable legs to move the lifter close to a wall if necessary. 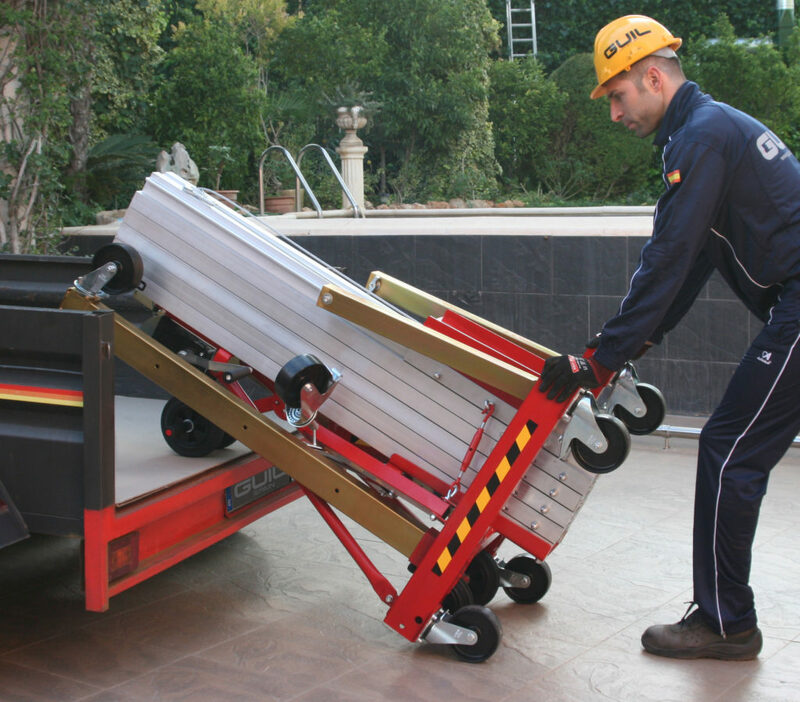 – For a quick, easy and safe raising of the lifter it comes with a double-handled automatic brake winch which stops and holds the load at the desired height. 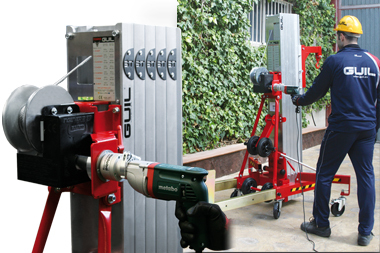 – The lifter is provided with neodymium magnetic locking pins (preventing loss). 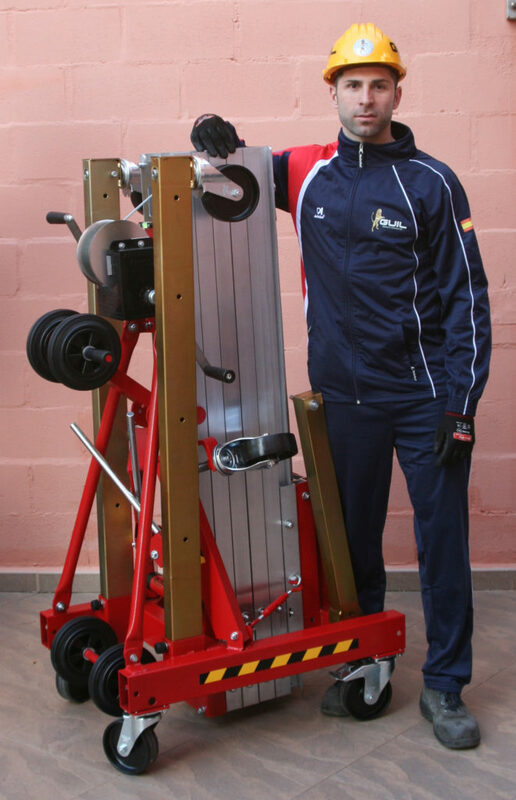 – 100% made in Spain, at our factory in L’Alcudia (Valencia). – Maximum versatility. 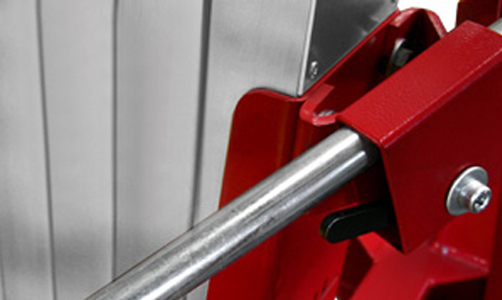 A wide range of accessories & adaptors available to fulfil all lifting needs. 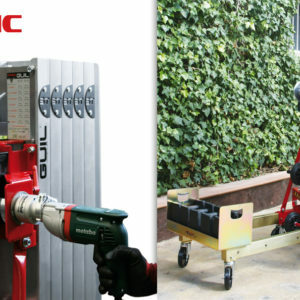 – It can be used for industrial and residential installations, for both indoor and outdoor use. 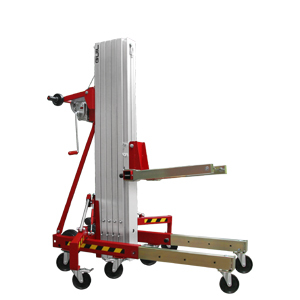 TORO D-403/C Material lifts are manufactured using the most advanced technology, carefully selecting the raw materials and having a strict quality control throughout the whole manufacturing procedure. 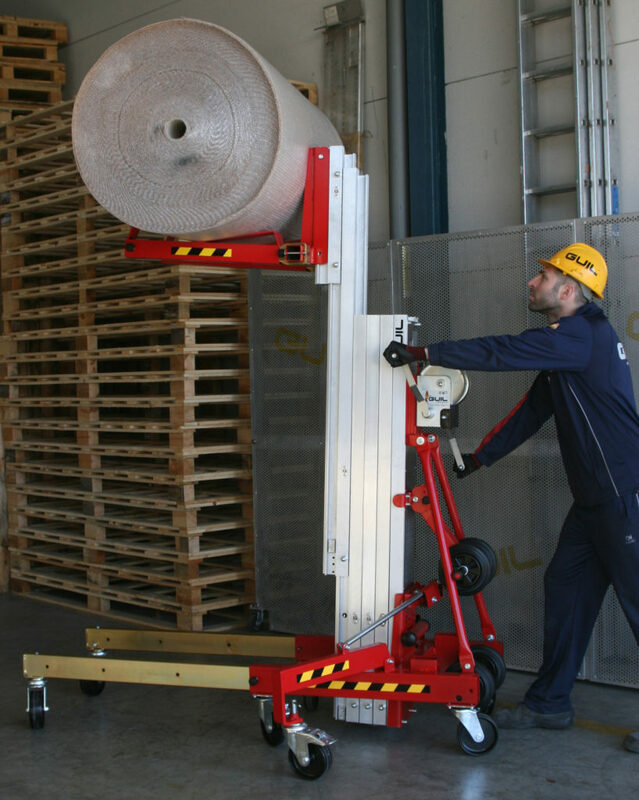 This way we guarantee maximum safety and durability, complying at all times with the lightweight, sturdiness and manoeuvrability requirements needed to safely lift heavy loads. 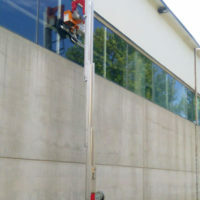 The automatic braking system stops and holds the load at the desired height: once you have reached the desired height, by letting go of the winch handles the braking system automatically stops and holds the load in place. 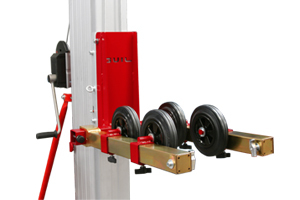 Internal Pendulum Brake system (IPB): Consists of an internal pendulum system that is automatically activated on each mast section if they were to suddenly fall, which can be easily unblocked by a trigger on each profile (MSU System). 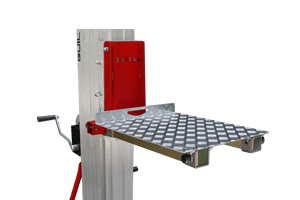 Mast Section Unblocking system (MSU): Each mast has an external trigger that allows the user to unblock the individual profiles when the pendulum brake is activated. 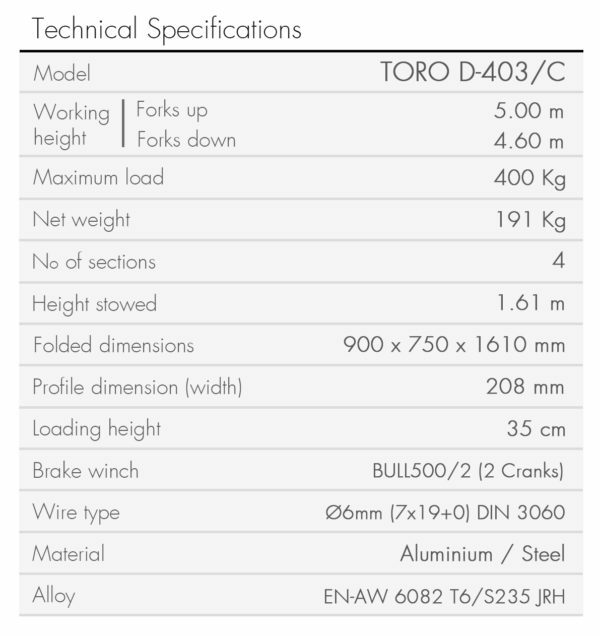 TORO D-403/C Lifters comply with the quality system requirements of European rules and regulations marked by the Norm 2006/42/CE. 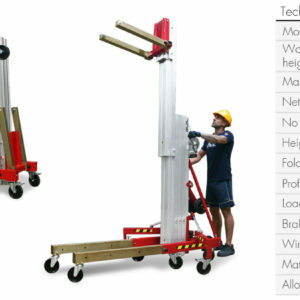 – THE LIFT IS NOT TO BE USED AS A HOIST FOR LIFTING, SUPPORTING OR TRANSPORTING PEOPLE. 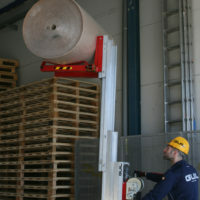 – For outdoor use, the tower must be secured with slings, wires, ropes, etc. 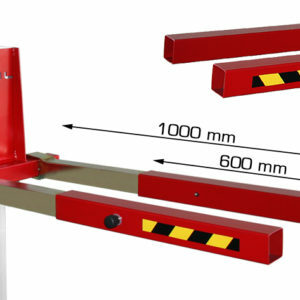 to prevent movement caused by windy conditions and guarantee maximum stability. 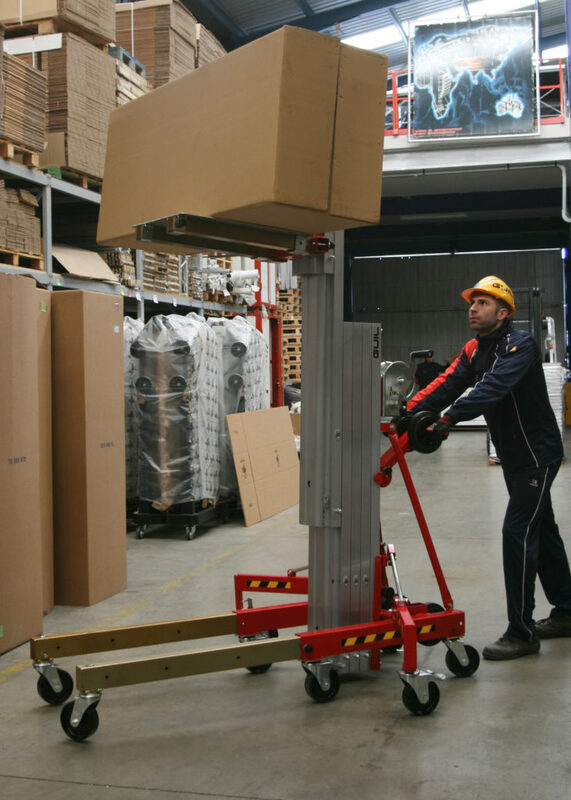 The lifter is equipped as standard with two folding and adjustable stabilizer legs that allow greater stability of the load and a perfect positioning of the tower. 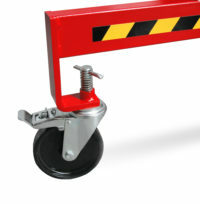 The stabilisers come with two swivel casters with brake (Ø 150mm), equipped with a LEVELLING SPINDLE. Compact base of 900 x 640 mm manufactured in sturdy steel and finished with a double layer of textured powder coating (Epoxy) for outdoor use. The base is specially design so that the legs can be inserted both at the front and the back of the tower, this way giving the option to use it flush to the wall or workspace if needed. 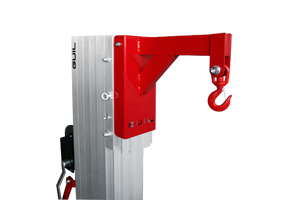 Note: Counterweight holder and weights available for this function. 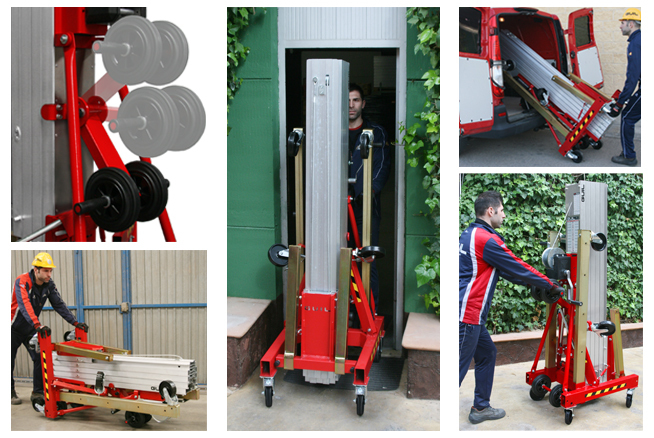 This special feature make our TORO D-Range lifters one of the most functional models on the market (2 towers in 1). 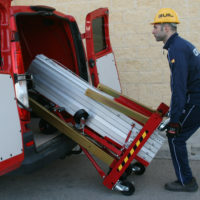 – Two telescopic legs, adjustable to 4 positions, provided with magnetic locking pins (to prevent loss). 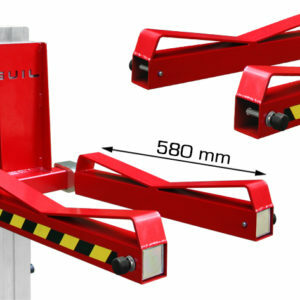 These legs have 2 Ø150mm swivelling wheels with leveller spindles to level the lifter is needed. (Note: the legs have a locking system to block/unblock the screw jack). To protect the aluminium mast sections. – Four Ø150mm swivelling wheels, two with brakes. 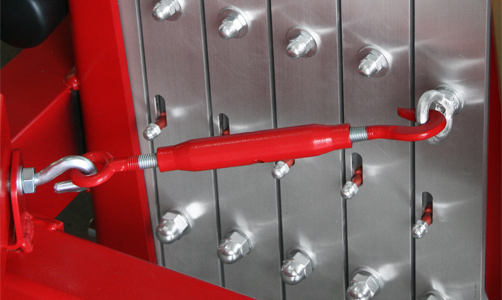 The legs have a locking system to block/unblock the screw jack. 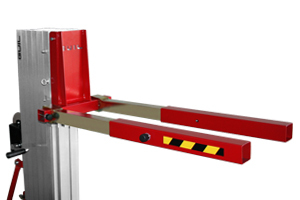 A manual holder is included to keep the user manual with the tower at all times. 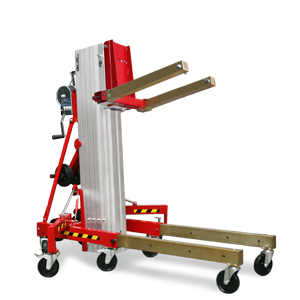 TORO D-403/C come with 660 x 60 x 60 mm reinforced steel forks as standard and magnetic locking pins for a quick set-up and to prevent loss. 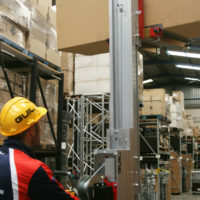 – Special reversible design; to be able to set them at two different heights, gaining more height when fully extended. 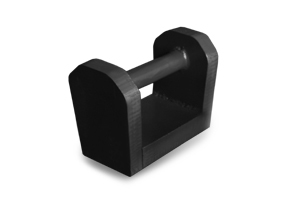 – Adjustable design; to accommodate different load sizes. 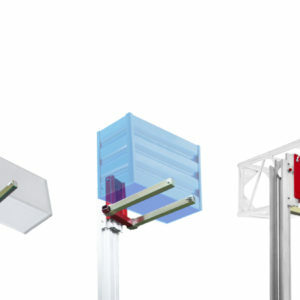 – The forks can be removed; for a more convenient transporting and storage of the tower. 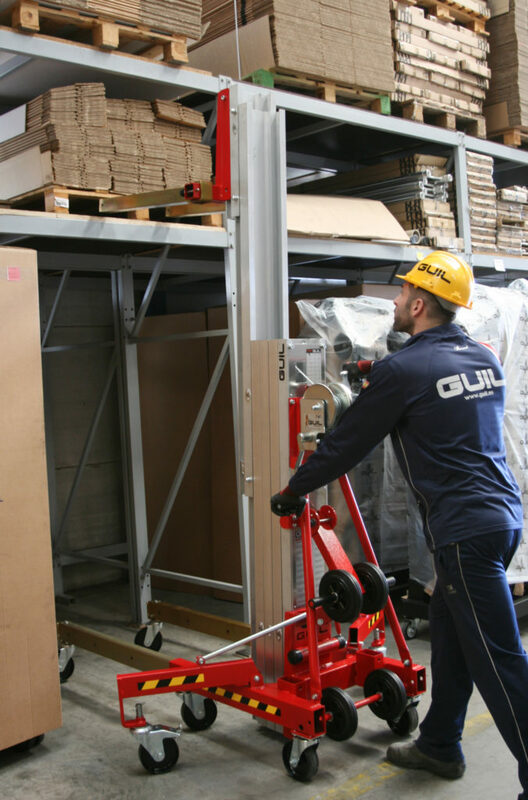 The lifter is equipped with 4 mast profiles made of high strength extruded aluminium (Alloy: EN-AW 6082 T6 according to the norm UNE-EN573-3:2009/UNE-EN755-2:2009) that are extended by means of pulleys with bearings covered and a galvanised steel wire rope for high strength and durability (specially manufactured for lifting heavy loads). 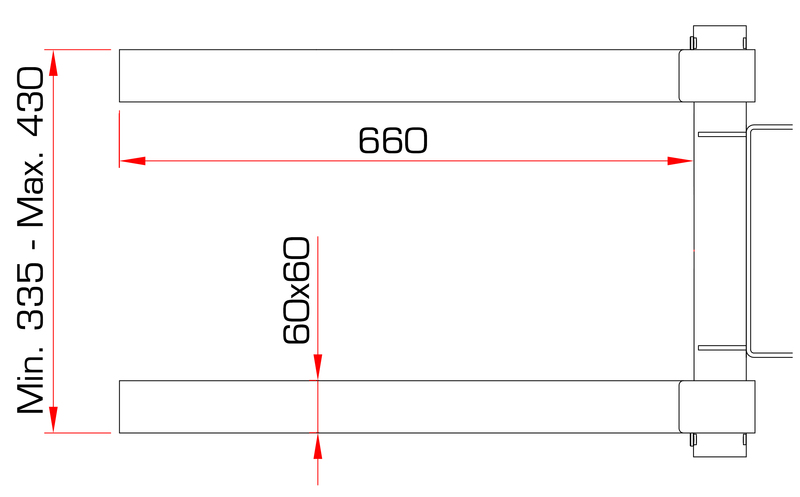 Note: Shorter mast profiles that the standard versions, achieving a more compact lifter (with a stowed height of just 1.61 m). The mast sections are secured to the base with a “U” shaped steel plate which is larger and thicker than most. 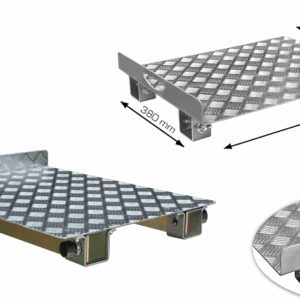 The tower base has a blocking hook to prevent profiles from moving during its horizontal transportation. > 4 swivelling wheels on the base, two with brakes. 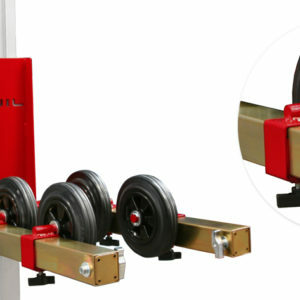 > 2 swivelling wheels with leveler spindles, found on the telescopic legs. 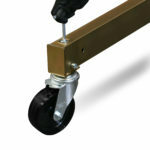 > 2 swivelling legs with brake and levelling spindles, found on the side stabiliser legs. 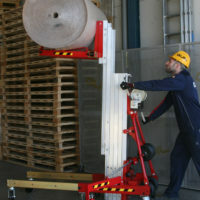 > 2 wheels on the back of the base, which are used to help to tilt the tower back into the horizontal position. 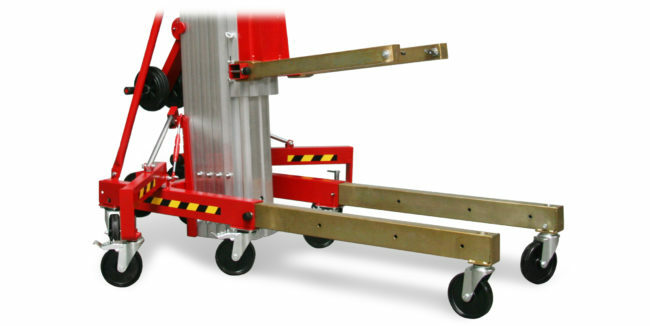 > 2 wheels on the back of the tower on the manoeuvring handles (fold-away with three positions), which protect it from possible bashes. 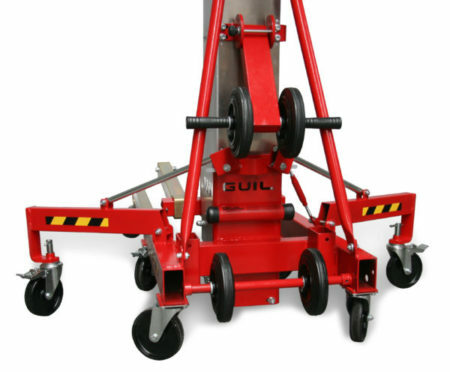 Note: All the wheels are specially designed for delicate flooring (non-marring). 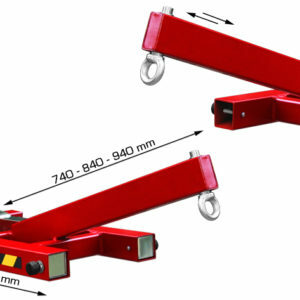 Due to their high load capacities, wide variety of possible applications, compact and manoeuvrable design and their simple use, the TORO Material Lifts are the perfect tool for any type of manual work. 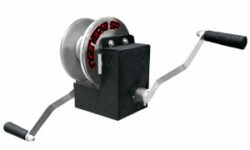 * Auto-brake Winch (Ref. 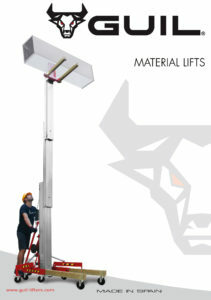 BULL500/2) with two detachable crank handles saving on space in storage and transportation. Complies with European Directives. 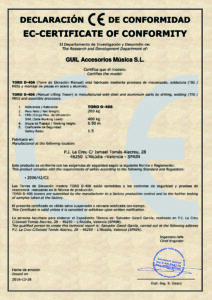 (European manufacturer). * Forks with reversible design to gain height. Detachable for convenient transporting and storage. 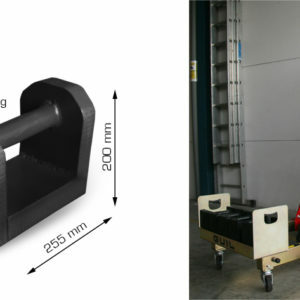 * Large wheels (Ø200 mm) for easy manoeuvring. All wheels made with special non-marring elastic material. * Fitted with 2 stabliliser braces for greater lift stability. * More mast overlap for a greater resistance. Prevent fishing rod effect. 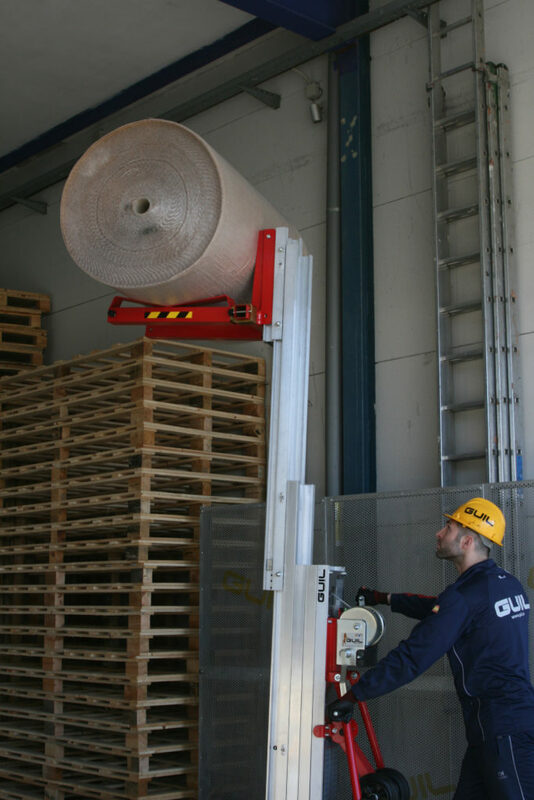 We are a Spanish factory with more than 35 years in the metal industry, specialising in the design and manufacture of material lifts, renowned for being highly innovative and efficient. 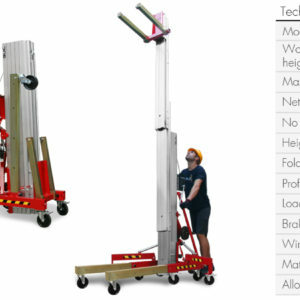 On this website, our division of Material handling lifters for the industrial and construction world are displayed, as well as the division of Lifting Towers for Shows and Events. 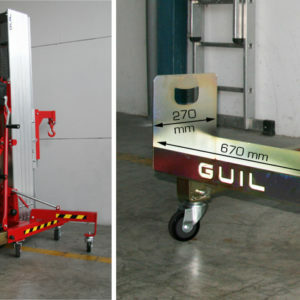 GUIL develops a new system to convert manual lifting towers into electric towers.  Copyright © 2019 Web design - All right reserved.